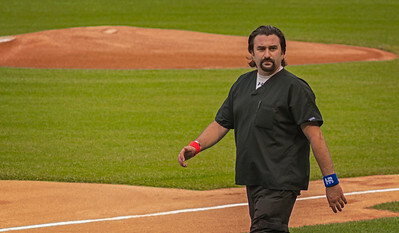 Warriors' Watch Rider in Attendance at the Chicago Police vs Chicago Fire Charity Baseball Game US Cellular Field Chicago, Illinois. 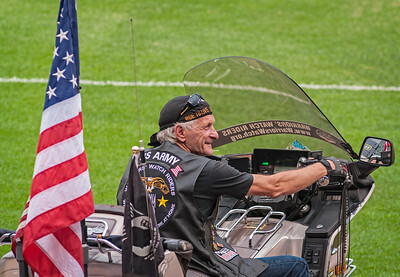 Their mission statement, THE WARRIORS’ WATCH RIDERS ENVISION A DAY WHEN EVERY MEMBER OF THE UNITED STATES ARMED FORCES, AT HOME AND ABROAD, AND THEIR FAMILIES, FEEL APPRECIATED, HONORED, RESPECTED AND LOVED BY THE CITIZENS THEY RISK THEIR LIVES TO PROTECT. The game, played annually (this is the 14th year) is played to honor the men and women who gave their lives in the line of duty. A few of the Chicago Firefighters discussing their strategy prior to the game. 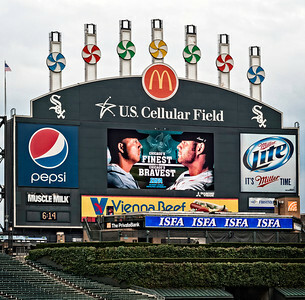 The Charity Baseball Game between the Chicago Police and Chicago Fire is played annually (this is the 14th year) to honor the men and women who gave their lives in the line of duty. 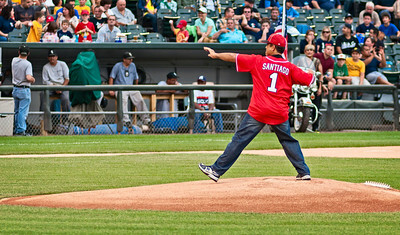 Dr. Sargon B. Odisho is the Physician to both the Chicago Police and Chicago Fire Baseball teams. He is also the Owner/CEO of the Chicago FIX. Dr. Odisho and his firm Chicago FIX are sponsors to this event which is played to honor the men and women who gave their lives in the line of duty. 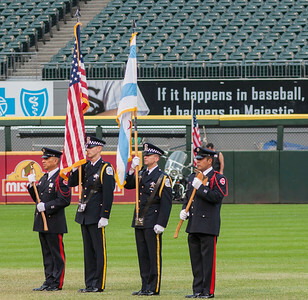 The Color Guard representing the Chicago Police and the Chicago Fire holding the flag of our sovereignty and the flag of the City of Chicago at the Charity Baseball Game at US Cellular Field, the home of the Chicago White Sox professional baseball team. The game, played annually (this is the 14th year) is played to honor the men and women who gave their lives in the line of duty. 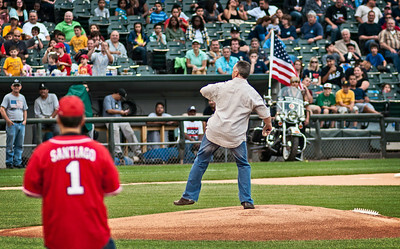 The Chicago Fire vs Chicago Police Charity Baseball Game is played annually, this year marked the 14th year, to honor the men and women who gave their lives in the line of duty. 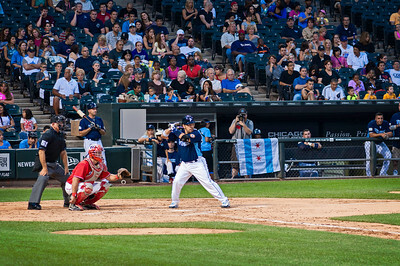 Eric Diaz, Chicago Police Second Baseman at bat. 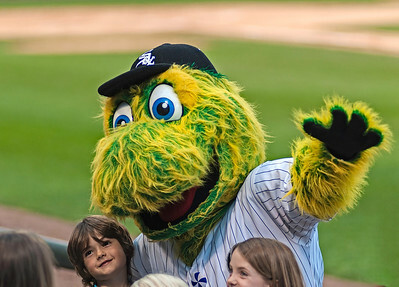 The Chicago White Sox mascot 'Southpaw' representing the Chicago White Sox Professional Baseball Team at the Charity Baseball Game at US Cellular Field, the home of the The Chicago White Sox, where the game is played annually (this is the 14th year) to honor the men and women who gave their lives in the line of duty.